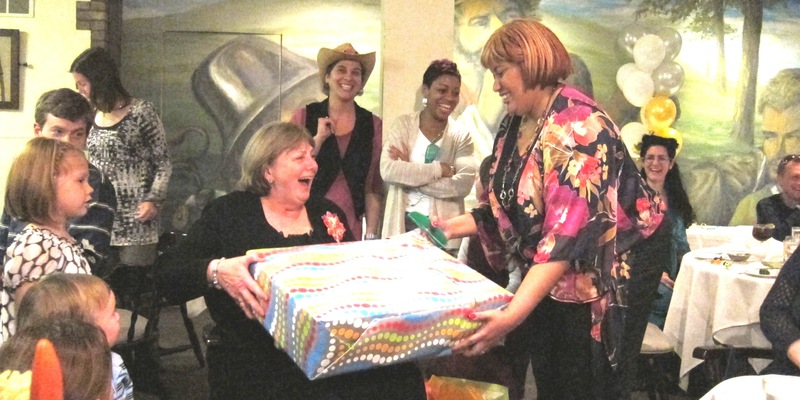 On Friday, March 30th, we celebrated Barbara Mullineaux’s retirement at Ristorante La Buca in Philadelphia, Pennsylvania. Barb’s family joined current PHS staff and PHS retirees for the festivities. The party had a Hawaiian theme; guest adorned themselves in flower leis and quirky sunglasses. Barb was a part of the PHS family for over 15 years. As our Senior Administrative Assistant, she worked closely with Fred Heuser. From the Philly staff, to the PHS Board, to our colleagues in Louisville, Barb served in many different ways. No matter what project needed to be accomplished, her warm, nurturing, gracious spirit made it a pleasure to do the task. She received many gifts but one that stood out was a memory book created just for her. We invited Barb’s colleagues to share memories so that they could be compiled into a scrapbook along with images from her time at PHS. We wish only the best for her!